Traditionally, we always serve red mulled wine in our house at Christmas, but this year, I'm going to try to impress my guests with something a little different - white mulled wine. To serve between 4 and 6 people, simply fill a large saucepan with 750ml of dry white wine, 400ml of cider, 8 whole cloves, 2 cinnamon sticks, 1tsp lemon juice, 1tsp golden caster sugar and a few lemon slices. Bring to a gentle boil and simmer slowly for 5 minutes, then add more sugar to taste if required. 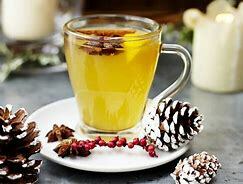 Strain and then serve in heatproof glass mugs, with lemon slices and cinnamon sticks to garnish.